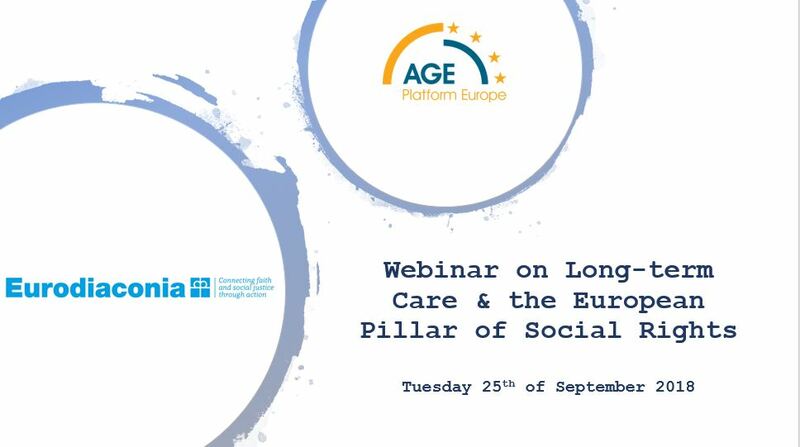 Our webinar on long-term care & the European Pillar of Social Rights is online now. The webinar was held today by our Policy Officer Alexander Elu, in cooperation with Mr. Borja Arrue and Mr. Philippe Seidel from our partner AGE Platform. 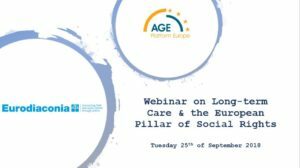 The webinar aimed at providing the participants with a better understanding of the European Pillar of Social Rights as a policy tool, as well as assessing its implementation in the area of long-term care. Our partners form AGE Platform Europe joined the webinar and provided a short analysis, followed by a discussion with participants. The European Pillar of Social Rights contains 20 principles and has been jointly proclaimed by all EU Institutions last year. Thus, all EU Institutions and the Member States have made a commitment to implement those 20 principles and to make the inherent social rights a reality for all persons legally residing on their territory. Principle 18 regards Long-term care and includes the right of everyone to affordable long-term care services of good quality, in particular home-care and community-based services. Watch our latest webinar on our website.